I have a standard localhost SOA 11.1.1.4 install. I have global result caching enabled (default) and i enabled result caching for my business service. However, the result is not cached. I have checked coherence configure files under C:\Oracle\Middleware\user_projects\domains\soa_domain\config\osb\coherence, but I couldn't tell what's wrong. 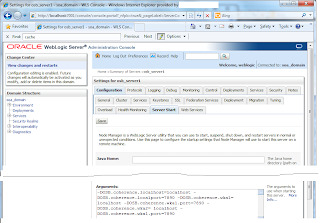 Log into Oracle WebLogic Server Administration Console. In the Change Center, click Lock & Edit. In the Domain Structure window, expand the Environment node. 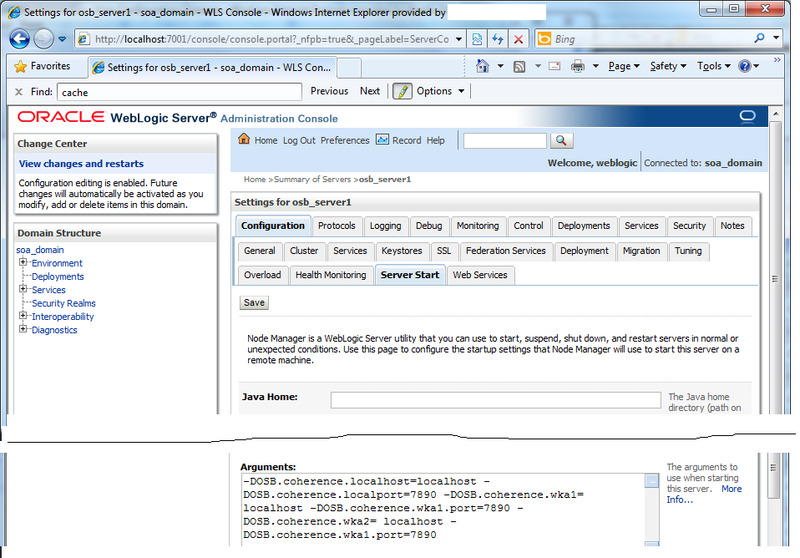 Click the name of the server (represented as a hyperlink) in the Name column of the table. The settings page for the selected server appears. Except step 6 is not 100% clear, it should say to put the value into the "arguments" field. See screen shot. After that I restarted OSB server, and it worked.